TransJakarta in Jakarta, Indonesia. With a length of 210 km (2015), it has the longest BRT system. Bus rapid transit (BRT, BRTS, busway) is a bus-based mass transit system that meets certain conditions. A true BRT system generally has specialized design, services and infrastructure to improve system quality and remove the typical causes of delay. Sometimes described as a "surface subway", BRT aims to combine the capacity and speed of a metro with the flexibility, lower cost and simplicity of a bus system. The first BRT system was the Rede Integrada de Transporte ('Integrated Transportation Network') in Curitiba, Brazil, which entered service in 1974. This inspired many similar systems around Brazil and the world, such as TransMilenio in Bogotá, Colombia, which opened in 2000. As of November 2016, a total of 207 cities in six continents have implemented BRT systems, accounting for 5,468 km (3,398 mi) of BRT lanes. As of November 2016, about 34.3 million passengers use BRT worldwide everyday, of which about 21.1 million passengers ride daily in Latin America, which has the most cities with BRT systems, with 69, led by Brazil with 34 cities. The Latin American countries with the most daily ridership are Brazil (11.9M), Colombia (3.1M), and Mexico (2.4M). In the other regions, China (4.4M) and Iran (2.1M) also stand out. The many differences and distinct features among existing BRT systems motivated the Institute for Transportation and Development Policy to form a BRT Standard Technical Committee in 2011, and to do further work in 2013. The ITDP set a minimum definition of what features must be part of a system to qualify as BRT, and created a BRT Standard to rate existing systems. The world's first BRT system, the Rede Integrada de Transporte in Curitiba, Brazil, was opened in 1974. "Bus Rapid Transit" takes its name from rail rapid transit, which describes a high-capacity urban public-transit system with its own right of way, multiple-car vehicles at short headways, and longer stop spacing than traditional streetcars and buses. BRT uses buses on a wide variety of rights-of-way, including mixed traffic, dedicated lanes on surface streets, and busways separated from traffic. The expression "BRT" is mainly used in the Americas and China; in India, it is called "BRTS" (BRT System); in Europe, it is often called a "busway"; in Australia it is often called a "T-Way" (short for Transit Way); while in Ireland and elsewhere, it may be called a "quality bus". The first BRT system in the world was the Rede Integrada de Transporte (RIT, "Integrated Transportation Network"), implemented in Curitiba, Brazil, in 1974.:5 Most of the elements that have become associated with BRT were innovations first suggested by Curitiba Mayor Architect Jaime Lerner. Initially just dedicated bus lanes in the center of major arterial roads, in 1980 the Curitiba system added a feeder bus network and inter-zone connections, and in 1992 introduced off-board fare collection, enclosed stations, and platform-level boarding. Other systems made further innovations, including platooning (three buses entering and leaving bus stops and traffic signals at once) in Porto Alegre, and passing lanes and express service in São Paulo. In the United States, BRT began in 1977, with Pittsburgh's South Busway, operating on 4.3 miles (6.9 km) of exclusive lanes. Its success led to the 1983 Martin Luther King Jr. East Busway, a fuller BRT deployment including a dedicated busway, traffic signal preemption, and peak service headway as low as two minutes. New Orleans ran buses on Canal Street in a dedicated right of way beginning in the 1960s. This style of service was maintained until 2004 when streetcar service was restored on this 4-mile (6.4 km) route segment. In January 2004 the first BRT in Asia, TransJakarta, opened in Jakarta, Indonesia. As of 2015, at 210 kilometres (130 mi), it is the longest BRT system in the world. Johannesburg’s BRT, Rea Vaya, was the first true BRT in Africa, in August 2009, carrying 42,000 daily passengers. Rea Vaya and MIO (BRT in Cali, Colombia, opened 2009) were the first two systems to combine full BRT with some services that also operated in mixed traffic, then joined the BRT trunk infrastructure. Roughly four decades after the first BRT system was deployed, 186 cities in all continents have implemented BRT systems as of October 2014, accounting for 4,757 km (2,956 mi) of BRT lanes. It is estimated that about 31.7 million passengers use BRT worldwide everyday, of which, about 19.7 million passengers ride BRT daily in Latin America (62.4%), 8.5 million in Asia (26.9%) and 1.8 million in Europe (5.7%). Latin America is also the region with the most cities with BRT systems, with 60, of which, led by Brazil with 33 cities. Europe ranks second with 53, Asia with 38, and the United States and Canada with 26. 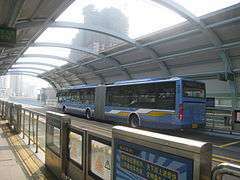 Elevated BRT system in Xiamen. Bus-only lanes make for faster travel and ensure that buses are not delayed by mixed traffic congestion. Separate rights of way may be elevated, in a cutting, or in a tunnel, possibly using former rail routes. Transit malls or 'bus streets' may also be created in city centers. Centre of roadway or bus-only corridor keeps buses away from the busy curb-side, where cars and trucks are parking, standing and turning. The MIO system in Cali pioneered in 2009 the use of dual buses, with doors on the left side of the bus that are located at the height of high-level platforms, and doors on the right side that are located at curb height. This buses can use the main line with its exclusive lanes and high level platforms, located on the center of the street and thus, boarding and leaving passengers on the left side. These buses can exit the main line and use normal lanes that share with other vehicles and stop at regular stations located on sidewalks, located to the right side of the street. For the system to work, users have the right to receive "credit" on the electronic cards: in this manner, passengers that have no money left on the cards can take the bus on sidewalk stops where there is no possibility to recharge these cards. This means that the balance in the card can be negative, up to two ticket fares, so passengers can take the bus in the street and recharge the card once they reach a main line station. As the card itself costs more than the maximum negative balance, the passenger has no incentive to default on his negative credit. Transmilenio in Bogotá followed suit in 2014 also creating routes that can use main line stations and regular sidewalk stations, but instead of giving credit to passengers to allow boarding the bus on sidewalks, published a map readable in smart phones giving the location of a very dense network of 4.000 recharging points, located in internet cafes and other business, that use a swipe-card terminal for recharging. This system has the additional benefit of diminishing queues on main line stations. High-capacity vehicles such bi-articulated buses may be used, typically with multiple doors to speed entry and exit. Double-decker buses or Guided buses may also be used. Advanced powertrain control may be used for a smoother ride. BRT systems typically feature significant investment in enclosed stations which may incorporate attractive sliding glass doors, staffed ticket booths, information booths, and other more standard features listed above. They will often include level boarding, using either low-floor buses or higher boarding platforms level, and multiple doors to speed passenger boardings and enhance accessibility to disabled passengers. Fare validation upon entry to the station in a similar manner to that used on entry to a subway system is also common, particularly at busy stations. A unique and distinctive identity can contribute to BRT's attractiveness as an alternative to driving cars, (such as Viva, Max, TransMilenio, Metropolitano, Select) marking stops and stations as well as the buses. A BRT system can be measured by a number of factors. The BRT Standard was developed by the Institute for Transportation and Development Policy (ITDP) to score BRT corridors, producing a list of rated BRT corridors meeting the minimum definition of BRT. The highest rated systems received a "gold" ranking. The latest edition of the standard was published in 2014. The following table lists the eight systems that were rated Gold based on the 2013 standard. Taiwan Taichung City BRT blue line vehicle (Yutong ZK6180HG, Chinese Yutong product). When TransMilenio opened in 2000, it changed the paradigm by giving buses a passing lane at each station stop and introducing express services within the BRT infrastructure. These innovations increased the maximum achieved capacity of a BRT system to 35,000 passengers per hour. Light rail, by comparison, has reported passenger capacities between 3,500pph (mainly street running) to 19,000pph (fully Grade-separated). "From these findings … there is little evidence to support the view that LRT can carry more than busways.". There are conditions that favor LRT over BRT, but they are fairly narrow. 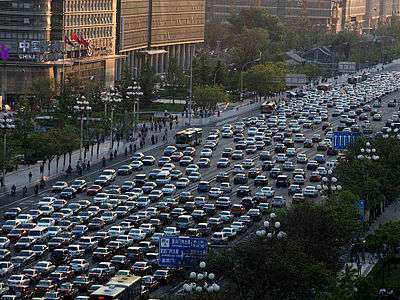 To meet these conditions you would need a corridor with only one available lane in each direction, more than 16,000 passengers per direction per hour but less than 20,000, and a long block length, because the train cannot block intersections. These conditions are rare, but in that specific instance, light rail would have a significant operational advantage. However, "... any perceived advantages of LRT over BRT are primarily aesthetic and political rather than technical … due to the perceived capacity constraint of BRT there are currently no cases in the US where LRT should be favored over BRT." Conventional scheduled bus services use general traffic lanes, which can be slow due to traffic congestion, and the speed of bus services is further reduced by the time spent at bus stops for passengers to board the vehicle, pay the fare, and to pull back into traffic. Kesennuma Line in Japan damaged in 2011 tsunami, JR proposed the line's conversion into a dedicated bus rapid transit (BRT) route, before railway's full restoration. The capital costs of implementing BRT are lower than for LRT. A study by the United States Government Accountability Office from 2000 found that the average capital cost per mile for busways was $13.5 million while light rail average costs were $34.8 million. However, the total investment varies considerably due to factors such as cost of the roadway, amount of grade separation, station structures, traffic signal systems and vehicles. Operational costs of running a BRT system are generally lower than light rail, though the exact comparison varies. In the study done by the GAO, BRT systems usually had lower costs based on "operating cost per vehicle hour", "operating cost per revenue mile", and "operating cost per passenger trip", mainly because of lower vehicle cost and lower infrastructure cost. Diesel BRT is also much less expensive than a trolleybus system. In the developing world the operating cost advantages of BRT over LRT or streetcar are greater. For the same level of ridership, higher labor costs in the US relative to in developing countries will tend to encourage US transit operators to use fewer larger vehicles and operate them at lower frequencies in order to minimize the number of drivers needed. This comes at a hidden cost to passengers who experience lower frequency and longer waiting times. An ambitious LRT system runs partly underground, which gives free right-of-way and much faster traffic compared to passing the traffic signals needed in a surface level system. Underground BRT is rare and expensive. As most buses run on diesel, air quality can become a significant concern in tunnels, however examples such as the Downtown Seattle Transit Tunnel use hybrid buses which switch to overhead electric propulsion while underground, eliminating diesel emissions and reducing fuel usage. An alternative is an elevated busway, which is also costly. Desire for grade separation indicates that a rail alternative could be better. TransMilenio was described as a "model BRT system" in the National Bus Rapid Transit Institute's May 2006 report. It serves Bogotá with high-capacity articulated buses, which passengers can board through three doors. Bi-articulated buses are used on the busiest routes. A smart card system is used for off-board fare collection. Despite moving 45,000 ppdph, Transmilenio faces huge problems (especially during peak hours), in terms of not being quite organized, nor having the necessary capacity for handling the high passenger volume, a situation not being limited to peak hours but at most times along the day. Ottawa's transitway and the Martin Luther King Jr. East Busway (in Pittsburgh) offer limited stop services along dedicated freeway high-occupancy vehicle lanes. The Rawalpindi-Islamabad Metrobus operates in the Rawalpindi-Islamabad metropolitan area in Pakistan and has length of 24 km and 24 stations. The buses run on segregated lanes in Islamabad, the capital and on an elevated track in Rawalpindi, the fourth most populous city of Pakistan. The daily ridership exceeds 150,000 people. Metrobus (Lahore)-Punjab-Pakistan, currently operates a fleet of 86 buses. The buses run on a single 28.7 km long corridor which includes Ferozepur Road, Model Town, Badshahi Mosque, Mozang Chungi, Gaddafi Stadium and other commercial parts of city. with two other corridors being under construction. Buses on the current route have an average speed of 26 km/h. According to the Lahore Transport Company, the daily ridership of the Metrobus exceeds 180,000 with the peak hourly ridership being 10,000 ppdph. An example of high-quality stations include those used on TransMilenio in Bogotá since December 2000, the MIO in Cali since November, 2008, Metrolinea in Bucaramanga since December, 2009, Megabús in Pereira since May, 2009, and most other Latin American BRT systems. This design is also used in Johannesburg's Rea Vaya. The term "station" is more flexibly applied in North America and ranges from enclosed waiting areas (Ottawa and Cleveland) to large open-sided shelters (Los Angeles and San Bernardino). BRTS in Ahmedabad in Gujarat, India, also known as Janmarg BRTS (People's way), has earned several awards and is regarded as the most efficient and the best in India. It complements the existing bus service of AMTS. It has considerably improved urban public transport. There are almost 100 BRTS stations with over 10 lines adding up to around 70 km. All BRTS stations except two are wheelchair accessible. The typical bus diesel engine causes noticeable levels of air pollution, noise and vibration. It is noted however that BRT can still provide significant environmental benefits over private cars (and if the lower cost of BRT is to lead to a more extensive, and thus more utilized system, this must be accounted for). 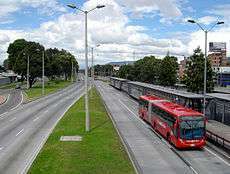 However, the main benefit of BRT systems from the environmental point of view is the substitution of regular buses for more efficient, faster and thus less polluting BRT buses: for example, Bogotá previously used 2.700 conventional buses to provide transportation to 1.6 million passengers daily, while in 2013 it transported 1.9 million passengers using 630 BRT buses, that is, less than a quarter of the old fleet, that circulates at twice the speed, with a huge reduction in contamination. With hybrid vehicles and trolleybuses, BRT designers hope to increase ride quality and decrease pollution. Bogotá started to use hybrid buses in 2012: they use regenerative braking to charge batteries when the bus stops and then use electric motors to propel the bus up to 40 km/h, speed at which the regular diesel engine starts automatically, with considerable savings in fuel consumption and pollutant dispersion. BRT can use trolleybuses to lower gaseous and noise emissions. The price penalty of installing overhead lines could be offset by the environmental benefits, potential for savings from centrally generated electricity, especially in cities where electricity is less expensive than other power sources. Trolleybus applications can be converted to light rail with the only extra expense being the laying and maintenance of tram tracks in the street. However, there is not a single example of a heavily used trolley system in the world. A different alternative is to use electrical propulsion. Seattle in its Metro Bus Tunnel, and Boston in Phase II of its Silver Line are using this method in their BRTs. In Seattle, dual-mode (electric/diesel electric) buses manufactured by Breda were used until 2004, with the center axle driven by electric motors obtaining power from trolley wires through trolley poles in the subway, and with the rear axle driven by a conventional diesel powertrain on freeways and streets. Boston is using a similar approach, after initially using trolleybuses pending delivery of the dual-mode vehicles in 2005. In 2004, Seattle replaced its "Transit Tunnel" fleet with diesel-electric hybrid buses, which operate similarly to hybrid cars outside the tunnel and in a low-noise, low-emissions "hush mode" (in which the diesel engine operates but does not exceed idle speed) when underground. The need to provide electric power in underground environments brings the capital and maintenance costs of such routes closer to those of light rail, and raises the question of building or eventually converting to light rail. In Seattle, the downtown transit tunnel was retrofitted for conversion to a shared hybrid-bus and light-rail facility in preparation for Seattle's Central Link Light Rail line, which opened in July 2009. BRT systems have been widely promoted by non-governmental organizations such as the Shell-funded EMBARQ program, Rockefeller Foundation and Institute for Transportation and Development Policy (ITDP), whose consultant pool includes the former mayor of Bogota (Colombia), Enrique Penalosa (former president of ITPD). Supported by contributions of bus-producing companies such as Volvo, the ITPD not only established a proposed "standard" for BRT system implementation, but developed intensive lobby activities around the world to convince local governments to select BRT systems over rail-based transportation models (subways, light trains, etc.). Beside the potential conflict of interests, BRTs are being questioned worldwide because of their contaminating effects in the urban environment. Unlike electric-powered trains commonly used in MRT, LRT and subways, bus rapid transit often uses diesel- or gasoline-fueled engines. To reduce pollution some BRT systems, such as TransJakarta, use liquefied natural gas-fueled engines instead. Furthermore, the lifetime of individual buses is generally shorter than their rail-based counterparts, potentially making the BRT system more expensive to operate in the long term. 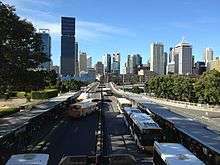 However, a principal criticism of BRT systems is that they may not accomplish their promise of an efficient, rapid flow of passengers along their dedicated bus lanes. The remarkable fiasco of Delhi's BRT and the increasing riots and spontaneous user demonstrations in Bogota raise doubts about the ability of BRTs to tackle issues such as the traffic jams induced by dedicated lanes. Overcrowded stations and BRT vehicles may fail to keep pace with increased ridership, and may eventually need to be replaced with high-capacity rail systems. ↑ "What is Bus Rapid Transit?". Select Bus Service website. NY Metropolitan Transit Authority. Retrieved 12 March 2010. 1 2 3 4 EMBARQ - The WRI Center for Sustainable Transport (November 2016). "Global BRT Data — Worldwide and Key indicators per region". BRTdata.org. Retrieved 2016-11-27. ↑ Greenfield, John (2013-03-12). "Taking the Guesswork Out of Rating BRT: An Interview With Walter Hook | Streetsblog Chicago". Chi.streetsblog.org. Retrieved 2014-02-24. ↑ "Recapturing Global Leadership in Bus Rapid Transit — A Survey of Select U.S. Cities". Institute for Transportation and Development Policy. May 2011. Retrieved 2015-06-03. ↑ "Bus Rapid Transit". EMBARQ. Retrieved 2014-02-24. ↑ "Architect of possible dreams". Congresosibrt.org. 2013-05-08. Retrieved 2014-02-24. ↑ Latin American Experience With Bus Rapid Transit Gerhard Menckhoff, World Bank. August 2005. Retrieved 08-15-13. ↑ Lotshaw, Stephanie (20 Jun 2011). "Profiles of American BRT: Pittsburgh's South Busway and East Busway". Streetsblog USA. Archived from the original on 3 February 2015. Retrieved 1 Sep 2015. Pittsburgh’s leadership on the urban sustainability front is not a recent phenomenon – in fact, it was the first city in the United States to implement elements of bus rapid transit, and it paved the way for more robust U.S. BRT systems. In 1977, only three years after Curitiba, Brazil implemented the world’s first BRT system, Pittsburgh opened the South Busway, 4.3 miles of exclusive bus lanes, running though previously underserved areas of the city, from the western suburbs to the downtown. The city was concerned about worsening traffic congestion, and, lacking the funds to rehabilitate the city's streetcar lines, took inspiration from Curitiba and created the South Busway. Funding for the system came from the Pennsylvania Department of Transportation, the state of Pennsylvania and Allegheny County. The Port Authority of Allegheny County, a county-owned, state-funded agency, operates the system. The success of the South Busway helped the city leverage funding for the expansion of the network, and in 1983, the Martin Luther King, Jr. East Busway opened. The East Busway began as a 6.8-mile network, with an additional 2.3 miles added in 2003, connecting the eastern suburbs with downtown. Fifteen bus routes run along its corridor. Its current weekday ridership is 25,600, with annual ridership close to 7 million. The East Busway built on the success of its predecessor and offered fundamental BRT features including a dedicated busway, service as frequent as every two minutes during peak period, signal prioritization, and direct service operations (more on that soon). However, there is no off-board fare collection. Instead, passengers pay upon entrance for in-bound trips and upon exit for outbound trips, which helps reduce delays in service because of fare collection. ↑ "New Orleans Public Service Inc. (NOPSI) Flxible New Look Buses 168-195 & 314-409 @ streetcarmike.com". streetcarmike.com. 1 2 Bambang Nurbianto (12 September 2015). "Train service has moved forward, can Transjakarta follow?". The Jakarta Post. ↑ "Terminos y condiciones tarjeta MIO". mio.com.co. Retrieved 2015-08-20. ↑ "Inicia Operación la Carrera 7 con Buses Duales | Transmilenio". www.transmilenio.gov.co. Retrieved 2015-08-20. ↑ "Tullave plus". www.tullaveplus.com. Retrieved 2015-08-20. ↑ "Tarjetas de TransMilenio ya se pueden recargar en todos los puntos SITP". Retrieved 2015-08-20. ↑ Institute for Transportation and Development Policy (ITDP) (2014). "About the Standard: What's New in 2014?". ITDP. Retrieved 2014-06-22. ↑ "2013 Corridor Rankings". Institute for Transportation and Development Policy. Retrieved 2014-06-22. 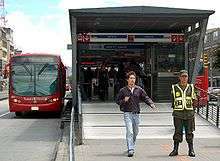 1 2 "Applicability of Bogotá's TransMilenio BRT System to the United States" NBRTI (May 2006). Retrieved 15 March 2010. 1 2 "City's BRTS didn't enhance public transport usage". The Times of India. 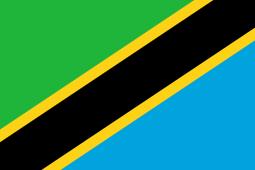 5 January 2016. Retrieved 12 January 2016. ↑ "Foro TransMilenio Fase III" (PDF). Archived from the original (PDF) on 27 February 2009. ↑ "Transmilenio 2013 statistics" (PDF). transmilenio.gov.co. Retrieved 2014-03-08. ↑ "International Public Transport Conference 2010 – Case Study of the Guangzhou BRT". Archived from the original on 13 July 2011. Retrieved 5 August 2010. 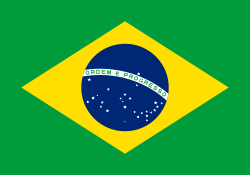 ↑ "BRT Data Latin America / Brazil / Curitiba". Retrieved 2014-08-24. ↑ "Intermodal Connectivity to BRT: A Comparative Analysis of Bogotá and Curitiba" (PDF). Journal of Public Transportation. Retrieved 2014-03-24. 1 2 "Characteristics of BRT for decision making" (PDF). Federal Transit Administration. 1 August 2004. Exhibit 3-22: "Maximum observed peak hour bus flows, capacities, and passenger flows at peak load points on transitways"
↑ "Security Check Required". facebook.com. ↑ "Tehran Bus Rapid Transit Transports 2 Million Passengers Daily – Herald Boy". heraldboy.com. ↑ "Dirut Transjakarta Targetkan Angkut 1 Juta Penumpang Setiap Hari". Kompas (in Indonesian). 7 January 2016. ↑ "Lord Mayor's Mass Transit Taskforce Report 2007". Brisbane City Council. ↑ W. Hook, S. Lotshaw and A. Weinstock (2013). "More Development For Your Transit Dollar. An Analysis of 21 North American Transit Corridors." (PDF). Institute for Transportation and Development Policy. p. 20. ↑ W. Hook, S. Lotshaw and A. Weinstock (2013). "More Development For Your Transit Dollar. An Analysis of 21 North American Transit Corridors." (PDF). Institute for Transportation and Development Policy. p. 21. ↑ "34th Street Select Bus Service". Bus service along 34th Street is among the slowest in the city. Buses travel at an average of 4.5 miles per hour (7.2 km/h), only slightly faster than walking. Despite these slow speeds, 34th Street is a major east-west bus corridor, carrying over 33,000 bus riders a day on local and express routes. ↑ "Impacts monitoring — fifty annual report" (PDF). Transport for London. ↑ "Characteristics of BRT for decision making." (PDF). Federal Transit Administration. 1 August 2004. p. ES-5. 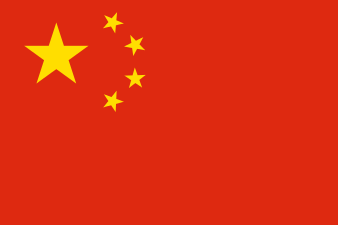 1 2 GAO (September 2001). "Bus Rapid Transit Shows Promise" (PDF). GAO. Retrieved 16 March 2011. 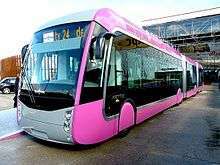 ↑ "BRTS may be linked with Metro in Indore – Times of India". ↑ Khan, Rameez. "Public transport: Govt to order studies on new Metro Bus projects". The Express Tribune. Retrieved 6 August 2013. ↑ "Lahore BRT System Study" (PDF). Lahore Transport Company. Retrieved 7 August 2013. ↑ "Historia". Transmilenio. Retrieved 20 August 2015. ↑ "Cali inauguró el MÍO". El País. Retrieved 20 August 2015. ↑ "Arrancó inauguración de Metrolínea". Vanguardia Liberal. Retrieved 20 August 2015. ↑ "Pereira se monta al Megabús". El Espectador. Retrieved 20 August 2015. ↑ "Van Hool presents the ExquiCity Design Mettis.". Retrieved 5 June 2012. ↑ "Historia". Alcaldía de Bogotá – Transmilenio. Retrieved 20 August 2015. ↑ "Informe de gestión de Transmilenio 2013 – page 18" (PDF). Transmilenio, Alcaldía de Bogotá. Retrieved 20 August 2015. ↑ "Inicio de operación de buses híbridos". Alcaldía de Bogotá – Transmilenio. ↑ "Edmonton Trolley Coalition". trolleycoalition.org. ↑ Metro Online (14 December 2007). "Downtown Seattle Transit Tunnel and Changing Bus Technology". King County Metro. Retrieved 13 July 2010. ↑ Duncan Allen (2005). "MBTA Silver Line". www.nycsubway.org. Retrieved 13 July 2010. ↑ Ross, Benjamin. "Big Philanthropy Takes the Bus". Dissent. Dissent. Retrieved 30 November 2016. ↑ "Peñalosa y su trancón de intereses". Al Garete (in Spanish). 24 January 2016. ↑ "Si Peñalosa no va a la ciudad, la ciudad va a Peñalosa". Al Garete (in Spanish). 7 March 2016. ↑ "Delhi's BRT Corridor to be demolished!". News Mobile. 18 January 2016. ↑ "Bloqueo TransMilenio". 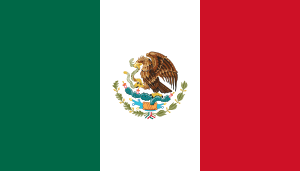 El Tiempo (in Spanish). "Characteristics of Bus Rapid Transit". National Bus Rapid Transit Association. 2009. Levinson, Herbert S. (2002). "Bus Rapid Transit: An Overview" (PDF). Journal of Public Transportation. 5 (2).